The sleeves of the Corset Pullover are done! I’ll do the lace edging and figure out how to kitchener live stitches to bound off ones tomorrow at SnB. 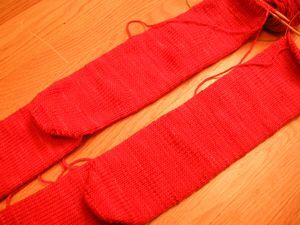 Also, the red socks are nearing completion – I’m alternating between the socks (I have to keep switching the needles, which is a pain) so I can use up all the yarn. I’m on the ribbing now. 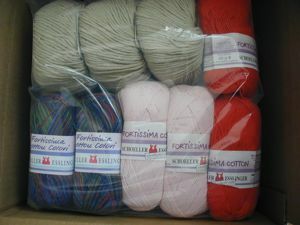 I got my box of yarn from Elann! 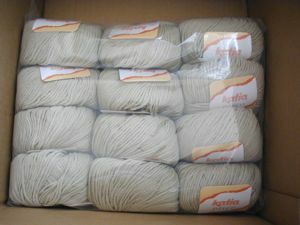 The Fortissima sock yarn is soooo soft. 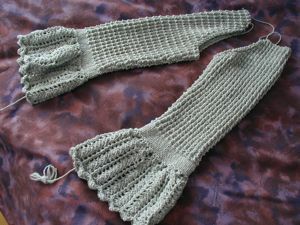 I want to order more to make tank tops or fine gauge sweaters or something – but I think the buy, buy, buy temptation on that has passed somewhat – that’s a good thing. 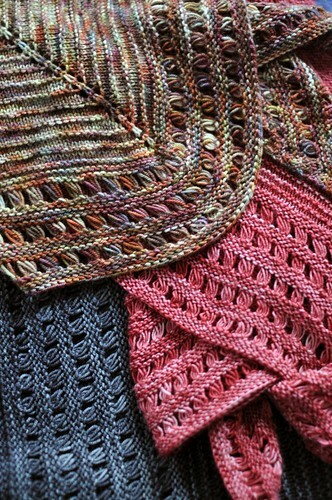 I think I’ll start the jacket with the Pisco tomorrow at SnB as well – I hope it’ll be a fast knit at 15 sts/4 in. Thanks for all the compliments on the cardi! I’m still feeling the finishing bug, so I’m hoping to sew on those buttons tonight and maybe even baste in the zipper on the Lotech. Well, at least pin it in. Two more things. 1) My friend Erin made a cardi! See her pics here. 2) I made a new pattern page for the cardi pattern, complete with new pictures. Check it out here.